…and what we’re seeing is how much more difficult it’s becoming for people to get finance. We use a five-step process to make sure hard-working Australians take advantage of the superb opportunity owning property in Australia brings – regardless of whether it’s one property or four. And as Sydney’s fastest growing Mortgage Broker, we must be doing something right. New clients are often uncertain and confused about the thousands of different home loan choices available to them… they struggle to understand what’s important to them and what will be important in the years to come. Our discovery session helps uncover your goals and aspirations – and we dive in and identify the challenges you face day to day, to understand the lifestyle you want to enjoy in the years to come. Next, we analyse the information we’ve uncovered, and we carefully consider strategic opportunities that will help you reach your goals – and achieve maximum financial gain. We focus on strategy… and we work together to develop the right strategy for your unique needs. Which means finding the home loan or investment loan that best fits all your requirements, to maximise all opportunities to grow your wealth. We introduce you to the people who can help you achieve maximum financial gain, and we help you take hold of opportunities with both hands. This is an exciting time. Over the years, we’ve built solid strategic partnership networks around the country so we’re able to quickly and efficiently put you in touch with the right people at the right time. Our network includes real estate agents, buyers’ agents, valuers and conveyancers. We’ll help you find areas that are undervalued or have a strong yield, consistent growth and good infrastructure and so will deliver the best returns. Throughout implementation, our team will proactively guide you through the process… while keeping the pesky paperwork to a minimum. Unlike the banks, you won’t have to jump through hoops blindfolded, and part of our strategy is to make this process seamless and efficient for you. We look after everything from pre-approval through to settlement and funding. We also have a legal team in-house to look after your conveyancing. After implementation, we actively monitor your loans and make necessary adjustments if required. 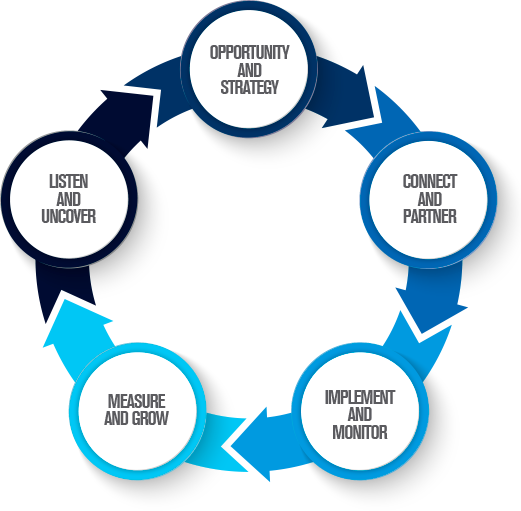 All good strategies need to be measured and monitored regularly. Maximising opportunities presented doesn’t just happen by chance. By using a carefully considered, superbly executed strategy and continually measuring the market and products, our clients are able to make the best of the amazing opportunity property ownership can bring. The result of following the Shore Financial process is growth… and financial gain.